I’ve maintained radio silence for a while, but I haven’t been idle. Being largely invested in a mix of defensive dividend yielders and growers, I’ve had a great first 6 months of the year, up 18.6% on a total return basis. With utilities, REITs and consumer staples up big year-to-date, I’ve trimmed some of my winners. I raised about 9% cash and put about half of that to work in a new stock. I may be early, but risk management is my discipline. TJX (TJX) — The parent of T. J. Maxx, Marshall’s and HomeGoods is a formidable discount retailer. Many consider it Amazon-proof because of their ability to source high-quality discount goods. There is also the treasure hunt factor luring shoppers into the stores and away from their computers. Yields 1.3%. Ross Stores (ROST) is their competitor and a similar good performer. Stock is just not cheap enough and the yield is not high enough to get me to pull the trigger. Probably my loss. Wells Fargo (WFC) — The best of the big banks. More involved in “boring old banking” than their megabank peers. Warren Buffett owns just shy of 10% of their shares. The upside is that it’s relatively cheap. I also like this one for its portfolio diversifying properties — it benefits from higher rates and a stronger economy. The downside is that the current low interest rates and the flat yield curve are crushing their NIM (Net Interest Margin). Political bashing in this election year makes for short-term downside, but now highly-regulated banks are in their best shape from a safety and soundness and capital standpoint in decades. Despite a generous 3.2% yield, I don’t see the urgency to buy it here, especially since their dividend growth rate downshifted to 1/2 a cent per share per quarter in 2016. Ford Motor (F) — The only car company not to be bailed out in the financial crisis. Great turnaround under Alan Mullally. Fat 4+% yield (plus special dividends) is attractive. Just too cyclical for me. With some auto loans stretching to 72 months, what happens to demand when the economy slows, and/or the Fed raises rates? Reported earnings today and was slammed down by 8% on guidance for a contraction in sales in 2017. Compass Minerals (CMP) — Sells mainly highway deicing salt for winter driving and has a small (10% of revenue) sulfate of potash business. Their long-lived, low-cost salt mines like the one at Goderich in Ontario benefit from salt’s low value-to-weight ratio and their access to cheap shipping throughout the Upper Midwest by barges on the Great Lakes and Mississippi River. Great 4% yield. Short-term concerns include the very warm winter last year leading to high salt inventories and weak pricing. 20% of their salt business by volume occurs in the UK and will take a currency hit from Brexit. A normal-ish winter in terms of snowfall would increase cash flows and help the dividend growth outlook. The long-term concern of global warming means that I want a big margin of safety on this one. Recent selloff has my trigger finger getting a bit itchy. Fastenal (FAST) — A great operator in a fragmented industry, sells fasteners and other industrial supplies to industrial and retail customers. Nice 2.9% dividend yield. They have been struggling to manage their transition from their hyper-growth store opening phase, to their current effort to invest in their sales force to sell their vending solutions to industrial firms. This and recent weakness in manufacturing prompt me to take a pass for now. Microsoft (MSFT) — Thank God for the arrival of Satya Nadella to replace Steve Ballmer. Nadella has refocused the company on investing in and growing their cloud business, Azure. Azure offers IaaS (Infrastructure as a Service) and PaaS (Platform as a Service) on a subscription model — you only pay for what you use. They are number 2 in the cloud to Amazon Web Services and growth was over 100% in the recent quarter. Given the explosion in data and computing power needed in the future, this looks like a secular grower with a lot of runway. They also have a SaaS (Software as a Service) business that is transitioning their legacy businesses to Office 365, and their Dynamics business includes ERP & CRM solutions. I don’t really know much about the wisdom of the LinkedIn deal, but given his performance so far, I’m willing to give Nadella the benefit of the doubt. With much improved capital allocation including a 2.6% dividend yield and good historic and expected dividend growth (this article anticipates an 11% dividend increase announcement in September), this is my kind of stock — a cash cow with good growth prospects. If you can’t guess, Microsoft was the winner of my investment derby, and is the newest member of my portfolio, with a 4%+ weighting. 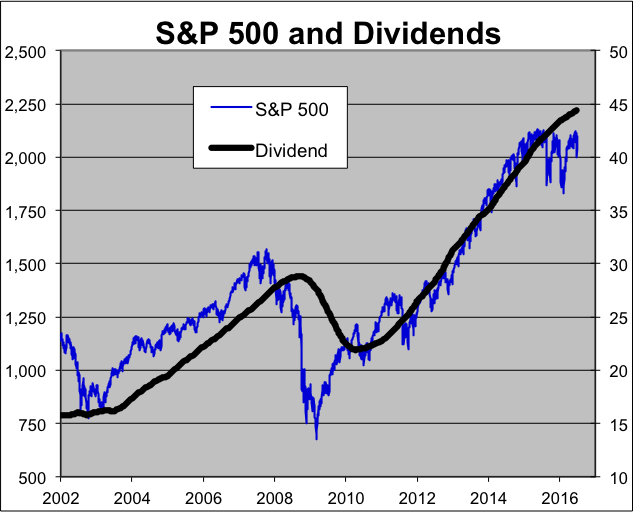 This great chart from Eddy Elfenbein shows the S&P 500 scaled against a 2% dividend yield. The rally since 2009 has been more than just the Fed. But, so-called bond-like stocks are expensive now. You want to discriminate between them (no ETFs for me) and prepare your portfolio for higher rates. In a time of low projected future returns on the indexes from the likes of Jeremy Grantham at GMO and Rob Arnott at Research Affiliates, people have rationally decided that all else equal, a higher yield with mid single digit growth will get you closer to a high single digit total return than an S&P 500 index fund is likely to do. As long as you sell the ridiculously overvalued in favor of the less overvalued and manage your risk. But I believe it is definitely time to lean a bit more toward value and the unloved. On this basis, Wells Fargo and Compass Minerals are high on my list for future buys. Non-Traded REIT Sales Plunge 75% in Three Years — Hurray!